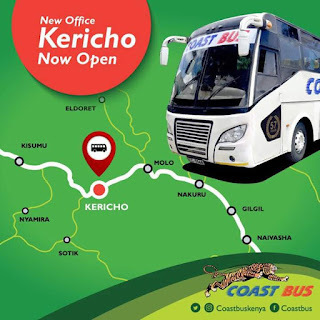 Tired of constant harassment and panics by the hungry unofficial bus agents around town whenever you or your family do have the need to travel out of Kericho town? Worry no more as Coast got you all sorted out. You can make bookings and send parcels directly to and from Kericho Town and feel more relaxed than never before as Coast Bus now officially launches its office in town. Book now and get sorted. Coast Bus, We Lead Others Follow..